That retort was somewhat successful in the early years — that is, during the time that the CIA and the Pentagon were successful in keeping their records relating to the assassination secret — but its effectiveness was stymied when increasing amounts of previously undisclosed JFK assassination-related evidence began to be released to the public, especially during the 1990s, when the JFK Records Act and the Assassination Records Review Board (ARRB) forced federal departments and agencies to disclose much of their assassination-related records to the public. As the newly disclosed circumstantial evidence mounted, it increasingly pointed in the direction of the national-security establishment as the orchestrator of the assassination, which made the decades-long secrecy make more sense. Keep in mind that the Warren Commission, which conducted much of its work in secret, ordered that much of the evidence it acquired during its investigation be kept secret from the American people for 75 years. Then, when the House Select Committee on Assassinations reinvestigated the Kennedy assassination in the 1970s, it ordered that much of its evidence be kept secret for 50 years. Imagine: All that secrecy in a case that involved nothing more than a supposed lone nut who supposedly assassinated the president. What many Americans still don’t realize is that there is still a mountain of assassination-related records that are still being kept secret, especially by the CIA, but which are set by the JFK Records Act of 1992 to be released in October 2017. An article about those records was published this week in Politico. It’s entitled “Why the Last of the JFK Files Could Embarrass the CIA” by Bryan Bender. The article is an excellent overall analysis of the situation and is really worth reading. Those still-secret records are being held by the National Archives, which has announced that the records will be released in October 2017, pursuant to the JFK Records Act, which itself set a time limit of 25 years for all JFK-related assassination records to be released. Time will tell, but my hunch is that the CIA and possibly other segments of the national-security establishment will end up requesting a further extension of secrecy, on the ground of “national security” of course. The reason I say that is not because the records are going to contain confessions or admissions of guilt but because of the likelihood that the still-secret records contain even more circumstantial evidence pointing in the direction of the national-security establishment as the orchestrator of a regime-change operation that took place on November 22, 1963. Adam Walinsky, who worked in the Kennedy Justice Department, believes that the mounting evidence over the years of a purposely botched autopsy of the president and the multiple “suicides” of so many figures connected to the events strongly suggests such a cover-up from high levels. In the years following the Warren Commission Report, supporters of the Commission’s findings often alluded to a “botched” autopsy or to the “incompetence” of the military pathologists. It seems to me that the term “purposely botched” connotes something different. To me, the phrase connotes an intentional act. That, in fact, is the theme of my ebook book The Kennedy Autopsy, which has continuously been on Amazon’s list of Top 100 Best-Selling Books in 20th-Century American History since last January. In that ebook, you will not find any wild-eyed conspiracy theories. All you will find is a compilation of circumstantial evidence relating to the autopsy that was conducted on Kennedy’s body by the national-security establishment. That circumstantial evidence leads inexorably in one direction — that the U.S. national-security state conducted a false and fraudulent autopsy on President Kennedy’s body and then issued a false and fraudulent autopsy report, as part of a cover-up of the Kennedy assassination itself. In my newest ebook, Regime Change: The JFK Assassination, which is also now on Amazon’s list of Top 100 Best-Selling Books in 20th-Century American History and also in Amazon’s list of Best-Selling Short Reads, I place that false and fraudulent autopsy in a larger context — one relating to Cold War regime-change operations, such as those that the national-security state conducted in Iran in 1953, Guatemala in 1954, Cuba in the 1960s, and Chile in the early 1970s. Also, see FFF’s third ebook on the JFK assassination, which focuses on motive: JFK’s War with the National Security Establishment: Why Kennedy was Assassinated by Douglas Horne, which until recently has also been on Amazon’s 20th-Century U.S. History list since January. Horne served on the staff of the ARRB. Permit me to set forth a dramatic example of this circumstantial-evidence phenomenon — the testimony before the ARRB on June 5, 1997, of Saundra Spencer. One, Spencer was never called to testify before the Warren Commission and the House Select Committee on Assassinations. Two, when Congress enacted the JFK Records Act, for some unknown reason it included a provision that prohibited the ARRB from reinvestigating the Kennedy assassination. Therefore, the ARRB was precluded from following up on Spencer’s testimony with an investigation. Who was Saundra Spencer? In November 1963, she was petty officer in charge of the White House Laboratory at the Naval Photographic Center in Anacostia, D.C.
As you read through Spencer’s sworn testimony before the ARRB, keep in mind the following important fact: the official autopsy photographs show the back of Kennedy’s head to be intact — that is, without a big exit hole that would imply a shot having been fired from Kennedy’s front. 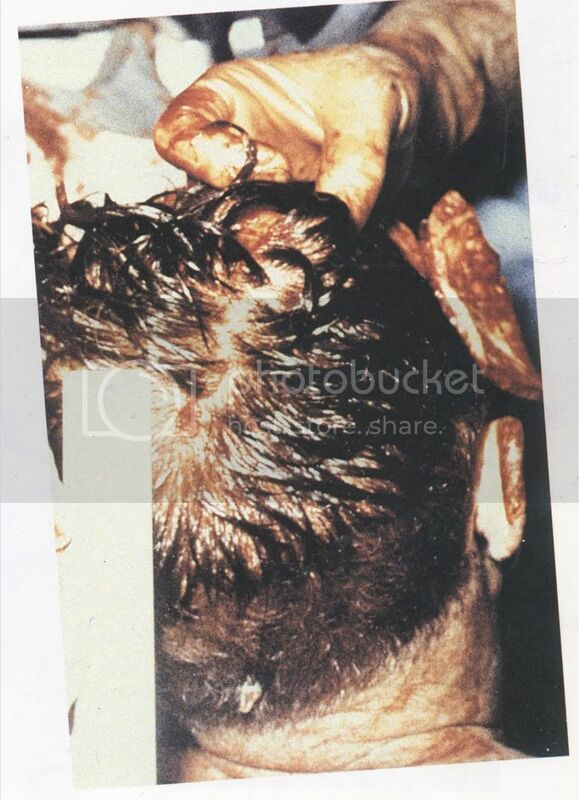 Here is a link to the official autopsy photograph showing the back of Kennedy’s head to be intact. Recall that Lee Harvey Oswald, the accused assassin, was situated in Kennedy’s rear. GUNN: What was your position in the White House Lab in 1963? SPENCER: I was Petty Officer-in-charge. GUNN: Did you have any supervisor who was also within the White House Lab? SPENCER: Chief Knudsen was our liaison and supervisor from the White House, but we fell under the Officer-in-Charge of the color lab, but they pretty much left us alone, [and we] did our own thing…. GUNN: How many people worked under you in the White House Lab in November ’63? Spencer: It averaged four to five at various times, people would come and go [and] as they transferred in and out, they were assigned to the Photographic Center, and they were then detailed to us. GUNN: Now, I would like to go to November 22nd of 1963, and ask you what you were doing when you first heard about the assassination of President Kennedy? SPENCER: I was sitting and color correcting a photo of John-John [taken] in President Kennedy’s office, and it came over the NPC radio speaker that the President had been shot. GUNN: After you heard that, what did you do? SPENCER: We just continued to work until we got word that they wanted to go ahead and close the NPC down and move all except our personnel out of the immediate areas…. GUNN: When you say they moved all the personnel out of NPC except “our area,” do you mean the White House area or the color lab area? SPENCER: They secured the color lab crews and we [the White House Lab unit under Knudsen] stayed. GUNN: Ms. Spencer, did you have any work after November 22, 1963 that was related to the death of President Kennedy? SPENCER: Yes. We were requested to develop 4” by 5” color negatives and make prints of an autopsy that was — we were told it was shot at Bethesda after the President’s body was brought back from Dallas. GUNN: I would like to come back to that in a minute. Prior to that, did you have any other work or responsibilities related to the death of President Kennedy? GUNN: Now, a few minutes ago you mentioned some work related to the autopsy photographs of President Kennedy. When did you first receive information that you would be doing some work on that issue? GUNN: Did you have any opportunity to observe the content of the negatives and the prints as you were working on them? GUNN: Can you describe for me what you saw as best you can recollect? SPENCER: Briefly, they were very, what I consider pristine for an autopsy. There was no blood or opening cavities, opening[s] or anything of that nature. It was quite reverent in how they handled it. GUNN: If I can just ask for some clarification, do you mean that the body appeared to be clean, had been washed? Is that what you are suggesting? GUNN: And that was different from what you had seen in other autopsy photographs, is that right? SPENCER: Yes. In other autopsies, they have the openings of the [body] cavities and the removing of vital organs for weighing and stuff of this nature. The only organ that I had seen was a brain that was laid beside the body. GUNN: Did you see any photographs that focused principally on the head of President Kennedy? Spencer: Right. They had one showing the back of the head with the wound at the back of the head. GUNN: …Ms. Spencer, could you go to the light box and tell me whether you can identify the color transparency of view no.1 … image no. 29, as having seen that before? GUNN: In what respect is the image no. 29 different from what you previously saw? SPENCER: Like I said, there was none of the blood and matted hair. GUNN: Can you explain what you mean by that? Are you seeing blood and matted hair on image no. 29? GUNN:–on the images you saw? GUNN: Do you recall whether there was a metal holder for the head on the images you developed? SPENCER: I don’t remember a metal holder. GUNN: Do you remember what kind of cloth or any other material was identifiable in the photograph in comparison to what you see in this image? SPENCER: As I remember, it was a darker cloth. This image [image no. 29] appears to be a towel over one of the trays, stainless-steel trays. GUNN: Previously, you said that, if I recall correctly, that the background in the photograph looked different from what you had previously seen in terms of — I understood that you said that it didn’t look like a hospital. GUNN: Could you describe the photograph that you see in front of you now, whether that is the same sort of background that you noticed in the photographs that you developed? SPENCER: Well, it could be the dark background, because normally, when you are doing the autopsies, the overhead lights and stuff are on. It appears that the lights have been turned off and that they were using a flash rather than just overall general lighting. GUNN: Do those two images [the color positive transparency and the print] correspond to the photographs that you developed at NPC in November of 1963? GUNN: In what way are they different? SPENCER: There was no — the film that I seen [sic] or the prints that we printed did not have the massive head damages that is [sic] visible here…. GUNN: Putting aside the question of the damage of the head, does the remainder of the body, the face, correspond with what you observed? GUNN: Ms. Spencer, you have now had an opportunity to view all the color images, both transparencies and prints, that are in the possession of the National Archives related to the autopsy of President Kennedy. Based on your knowledge, are there any images of the autopsy of President Kennedy that are not included in those views that we saw? SPENCER: The views that we produced at the Photographic Center are not included. GUNN: Ms. Spencer, how certain are you that there were other photographs of President Kennedy’s autopsy that are not included in the set that you have just seen? SPENCER: I could personally say that they are not included…. GUNN: Is there any doubt in your mind that the pictures you saw in November 1963 also were photographs of President Kennedy? SPENCER: No, that was President Kennedy, but between those photographs [that you showed me today] and the ones that we did, there had to be some massive cosmetic things done to the President’s body. Do you see the problem? Two different sets of autopsy photographs, one set that makes it into the official records and another set that is kept out of the official records and kept secret — one set (the secret set) showing a big exit hole in the back of Kennedy’s head (implying a shot from Kennedy’s front) and another set (the official set) showing the back of Kennedy’s head to be intact (i.e., with no big exit hole). All this obviously means but one thing: If Saundra Spencer was telling the truth — and there is absolutely no reason to doubt that she was — then there is but one conclusion any reasonable person can arrive at based on her testimony: that the U.S. military conducted a false and fraudulent autopsy on President Kennedy’s body, including the preparation of false and fraudulent photographs falsely depicting the back of the president’s head to be intact. GUNN: Mr. Sibert, does that photograph [autopsy photo no. 42, which shows the back of the head to be intact] correspond to your recollection of the back of the head? SIBERT: Well, I don’t have a recollection of it being that intact…. I don’t remember seeing anything that was like this photo. GUNN: But do you see anything that corresponds in photograph 42 to what you observed on the night of the autopsy? SIBERT: No. I don’t recall anything like this at all during the autopsy. There was much — well, the wound was more pronounced. And it looks like it could have been reconstructed or something, as compared to what my recollection was. GUNN: Okay. Can we take a look now at view number six, which is described as “wound of entrance in right occipital region,” color photograph no. 42. I’d like to ask you whether that photograph resembles what you saw from the back of the head at the time of the autopsy? O’NEILL: This [photograph of the back of the head] looks like it’s been doctored in some way. Let me rephrase that, when I say “doctored.” Like the stuff has been pushed back in, and it looks like more towards the end than at the beginning [of the autopsy]. All you have to do was put the flap back over here, and the rest of the stuff is all covered on up. GUNN: [using the head wound diagram Frank O’Neill made in 1978 for the HSCA] Do you see the wounds that you identified in the drawings that you made in 1978 on autopsy photograph no. 42? O’NEILL: No, I don’t see the wounds. GUNN: [now using autopsy photograph no. 38] Does the back of the head in photograph 38 [“posterior view of wound of entrance of missile high in shoulder”] … does the head wound [a small apparent entrance wound in the cowlick of the hair in the photograph is visible, whereas the right rear of the head appears to be intact] look like what you saw on the night of the autopsy? O’NEILL; …quite frankly. I thought that there was a larger opening in the back … opening in the back of the head. O’NEILL: No, I don’t recall that. GUNN: Do you recall a towel being under the President’s head at any time during the autopsy? O’NEILL: No. I don’t recall a towel being there, because I didn’t’ see the towel. Yes, but that would look pretty much like the mess that was there. So, there you have it: Not just Saundra Spencer saying that there was a large wound in the back of Kennedy’s head, implying an exit wound, but also two FBI agents who were testifying separately before the ARRB. Still not satisfied that the U.S. military’s autopsy photographs are false and fraudulent? See this video interview of Dr. Robert McClelland, who was one of President Kennedy’s treating physicians at Parkland Hospital. Click to 5:39 in the interview and proceed to watch McClelland describe the huge hole in the back of Kennedy’s head. What are the chances that Navy petty officer Saundra Spencer, FBI Agents Francis O’Neill and James Sibert, and Dr. Robert McClelland are all lying or that they somehow entered into a conspiracy with each other to pin Kennedy’s assassination on the national-security establishment? No reasonable chance at all. Their statements constitute proof beyond any and all reasonable doubt that the national-security establishment conducted a false and fraudulent autopsy on the president’s body. For more on how and why they conducted the false autopsy, including how and why President Kennedy’s body was secretly brought into the Bethesda morgue almost 1 and ½ hours before the start of the official autopsy, see FFF’s trilogy of books: The Kennedy Autopsy by Jacob Hornberger, JFK’s War with the National Security Establishment: Why Kennedy was Assassinated by Douglas Horne, and Regime Change: The JFK Assassination. Do you see now why the CIA and other elements of the national-security establishment are likely to ask for another extension of secrecy on the records that are set to be released by the National Archives in October 2017?